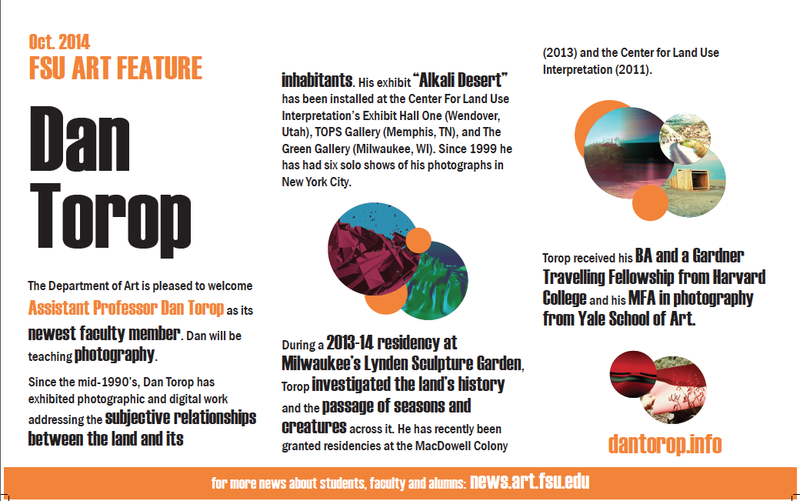 The Department of art is pleased to welcome Assistant Professor Dan Torop as its newest faculty member. Dan will be teaching photography. Since the mid-1990’s, Dan Torop has exhibited photographic and digital work addressing the subjective relationships between the land and its inhabitants. His exhibit “Alkali Desert” has been installed at the Center For Land Use Interpretation’s Exhibit Hall One (Wendover, Utah), TOPS Gallery (Memphis, TN), and The Green Gallery (Milwaukee, WI). Since 1999 he has had six solo shows of his photographs in NEw York City. During a 2013-14 residency at Milwaukee’s Lynden Sculpture Garden, Torop investigated the land’s history and the passage of seasons and creatures across it. He has recently been granted residenceis at the MacDowell Colony (2013) and the Center for Land Use Interpretation (2011). Torop received his BA and a Gardner Travelling Fellowship from Harvard College and his MFA in photography from Yale School of Art.